Disneyland is full of magic and imagination. I don't think anyone can argue that it's not. Walt Disney had a dream, and the courage to follow it through. Everyone who met Walt had nothing but great things to say about him. His friends, family, employees, and coworkers loved and adored him. If I knew nothing else of Walt, that would be enough. His tenacity was infectious. His energy spread across meetings like wild fire, and he was the king of brain storming. His movies and rides have stood up to the sands of time with middle fingers in the air, stating "You can't beat us!" I agree, his dreams were so powerful that it would take an act of God to beat them. 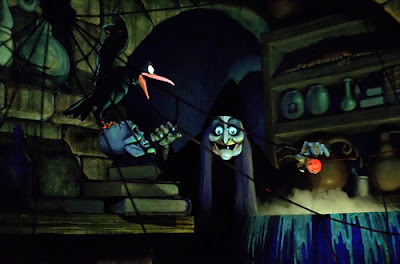 That being said, what the hell happened with the Snow White ride? Snow White was the very first animated motion picture. It was something that had never been done before. A full length animated cartoon. Everyone was excited to see it. The movie, as we all know, was a huge success and made more that 180 million at the box office. It reportedly cost two million to make, so ya, Walt knew what he was doing. Aside from Mickey Mouse, one could argue that it was actually Snow White that really got the ball rolling for Disney. So many of us overlook the historical features of the film, or that Walt and his crew had to invent the Multiplane camera to get the shots for the movie. That in itself is animation history gold! So why then does the ride at all of the Disney Parks fall short of that great film? I'm not saying that the ride is a bust, it's not. It's just not up to par with the other rides, though. Even Pinocchio is a longer ride that has more of a story line to it. My feelings are that for a movie that had such a huge impact on Disney and its history, why the short ride? Its short! There's no other way to say it! You go through a forest, you see the mines of the dwarfs, and then the witch falls off of the cliff, and cut. Kick the guests to the curb. That's it. Fade to black. Even when I was a little kid, I remember thinking, "Wait...that's it?" I want more. I think everyone would agree with me. It was fine when the park first opened in 1955, but times have definitely changed and there's only so much you can "add" to the ride to make it seem better (the rain, thunder, and holographic apple is a nice touch, though). I think they should start over. Make it as epic as it was. Make it a longer ride with full motion animatronics, and keep it just as creepy in the forest...that forest scared the crap out of me when I was little. OK, who am I kidding, it still makes me poop my pants a little. Disney World is trying right now to make it a little better. But I feel they're going around it the wrong way. 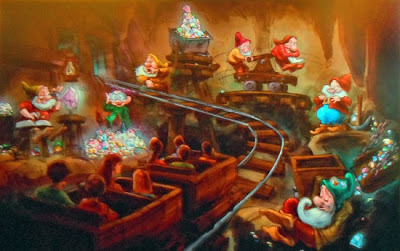 Making a mine car roller coaster is great, but Snow White at Disneyland can be ridden by everyone, newborns and all. I hope that someday the Imagineers can look at that ride and then decide to make it more than what it is right now. They're Imagineers, they do what no one else can, they dream and then build it into a reality. Give Snow White the credit and ride experience it deserves.